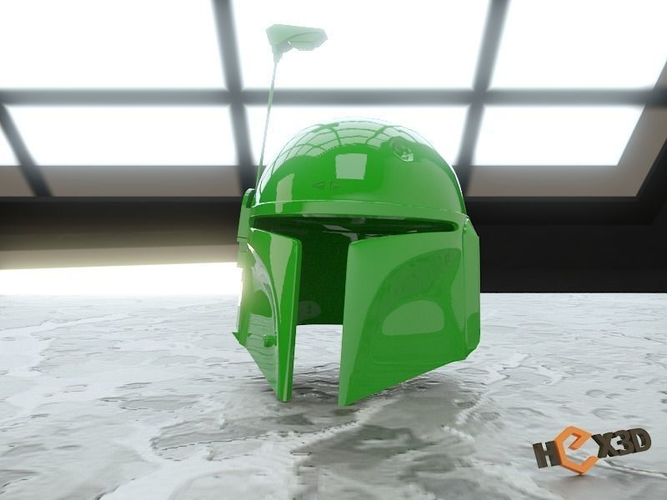 Boba Fett - 3D Printable Helmet 3D print model *Credit to Shaun Hadley for the printed/painted version you see in the photos above. This is reasonably screen accurate with the exception of the underneath of the sensor which was designed from as many screenshots as possible, but never a fantastic shot of the underside of the sensor, so we did the best we could with the resources available. If you also notice, we took the time to do a few things that are missing in other's helmets, like the iconic ridges in the back of the cranium. Extras required: 5mm Rod of any kind for the Sensor/antenna. Hole for inset is exactly 5mm. There has been one report of the hole being 3mm oddly, but everyone else has it at 5mm, so who knows. All pieces are placed dead flat at 0,0,0 on the build surface for you. We have tried very very hard to ensure all you need to do is load the file, select your settings and press print. This helmet is cut for a 20xcmx15cmx15cm build plate (ie Wanhao/CTC/Flashforge) but parts will fit on a 15x15x15cm plate, just oriented differently. LAYER HEIGHT: Since parts will be sanded and painted, we suggest 0.2-0.3mm layer height. INFILL: We suggest a 3-10% infill rate to keep the weight of the parts down. A full suit can be quite heavy if given too much infill. Supports / Rafts This is really up to you and your printer. These days printers with great cooling can perform some serious overhangs, it's going to come down to you knowing your printer and how what it's capable of. Please ask us a message in the comments if you would like to know more. This is a fan-made representation. We are in no way affiliated licensed by Disney or LucasArts. The hole for the sensor doesn't print out at 5mm. Its more like 3.5mm. Also doesn't appear to very accurate being that every reference photo I can find of Boba Fett the rod appears to be square. check your tolerances and slicing maybe, this has been printed several times now and the hole is 5mm. As for accuracy it's close enough for the 501 to approve it as far as i'm aware. If you need changes made please PM me, not comments here. I think you should update the description. Will PM you. Does this come with an uncut version? If not, can you make that available? I'd definitely buy. What is the default size of helmet? I have a 22 to 23 inch head. Awesome model, very highly detailed, just wish it had an articles range for der.